Envelope for Mt. 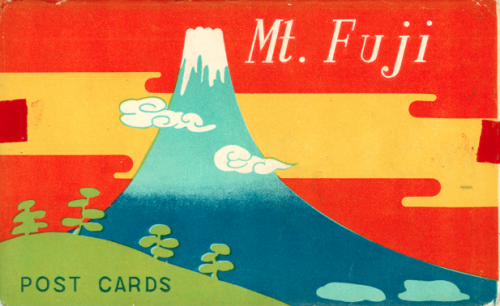 Fuji postcard set. Associate Professor of Japanese Joanne Bernardi has worked to build her ReEnvisioning Japan collection since 2000. She originally began purchasing Japanese artifacts to show in her classes. As the collection grew, Bernardi realized the potential her artifacts had in an online, curated digital environment. ReEnvisioning Japan’s objectives are “preservation, access and historical analysis.” Currently, the multimodal website holds thousands of artifacts that span a number of categories from “leisure and entertainment,” “postcards,” “tourism and travel,” and “edification and information.” Each category has multiple subcategories ranging from sheet music, children’s stories, maps, travel guides, etc. Every item has an image, an item number, and a description. Where necessary, visitors to the site can scroll through books, “read more” about a source, and even play a slideshow of all the images in a collection. In the 2016-2017 academic year, the project is continuing to migrate from its current WordPress CMS to Omega. This switch will involve significant redesigns for increased functionality and improved navigation, as well as new interactive components. The artifacts on the site represent 75% of the entire collection and efforts are ongoing to digitize and display the artifacts. Bernardi hopes that when the website is complete it will “allow for a dynamic community of contributors” who will add to the archive’s content, thereby enriching the collection and “forging new paths of inquiry” or “reenvisioning” traditional ways of knowing about Japan and tourism.